I fond this Awesome Tool to change Your Windows 8 Boot Screen! Does this also work with Windows 8.1 (running on a Surface Pro 2)? I haven't the time to test this app to see if that is the case. I will look into it later. Thanks. A BGRT app would be a nice vanity. Test system is Intel NUC DC3217IYE with D33217GKE motherboard. Current BIOS from Intel.com is v0050, filename GK0050.BIO. 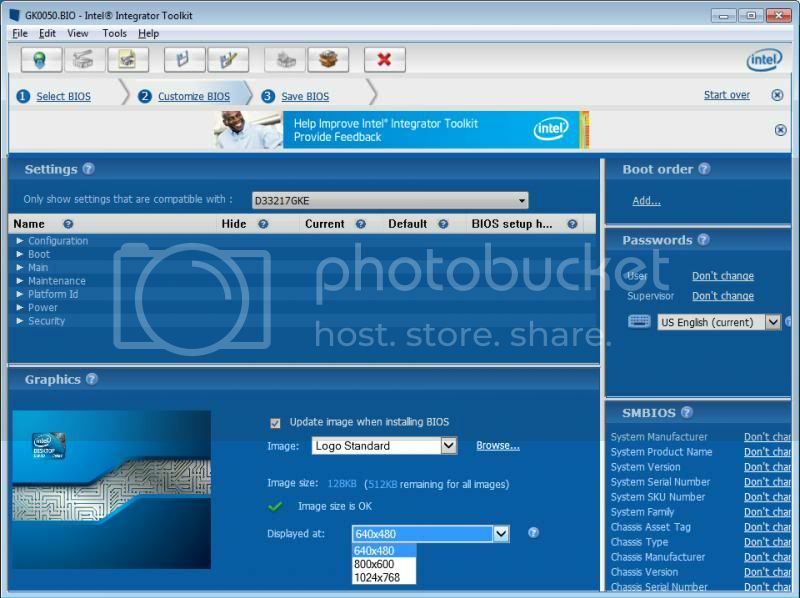 Using Intel Integrator Toolkit v5.0.4.575. 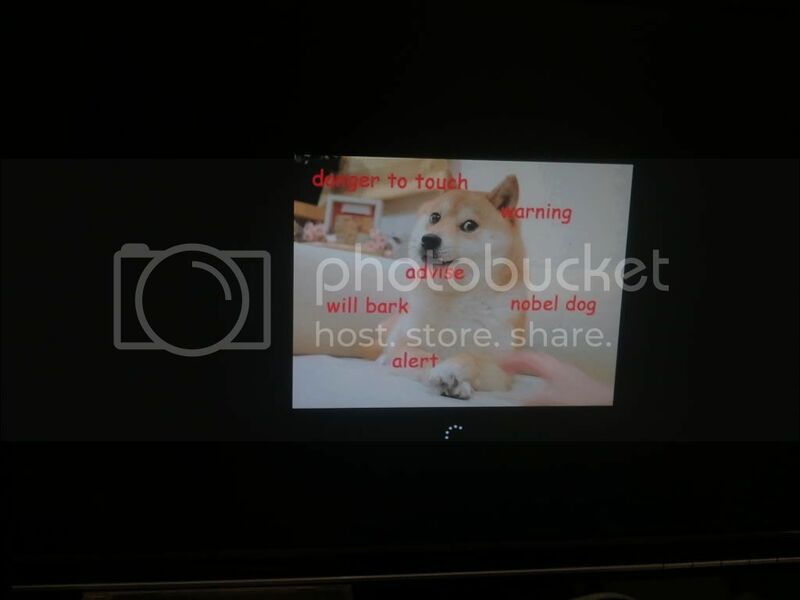 Using random 640x480 image from Google images, change to BMP format. Replace image and save new BIOS using Win8Logo Standard Portrait Image option (Logo Standard does not show in UEFI boot). Flash BIOS. UEFI PXE boot, verify BGRT is read by WinPE5. Success! BIOS modification worked! Deploy Windows 8.1 Pro image to GPT disk. Reboot, sysprep. Turn PC back on. Confirm that Windows 8.1 shows BGRT image during initial boot! Go through OOBE with network cable disconnected (this makes OOBE skip that Live account nonsense), Verify Activation. Restart (for some reason the Windows icon on the taskbar would not work until restart which is required to launch elevated CMD easily) Disable Testsigning with BCDEdit with Elevated CMD. Install 8oot software. Import Nuno Brito to replace stock Windows 8 boot image. Generate bootres.dll and apply changes. Restart. 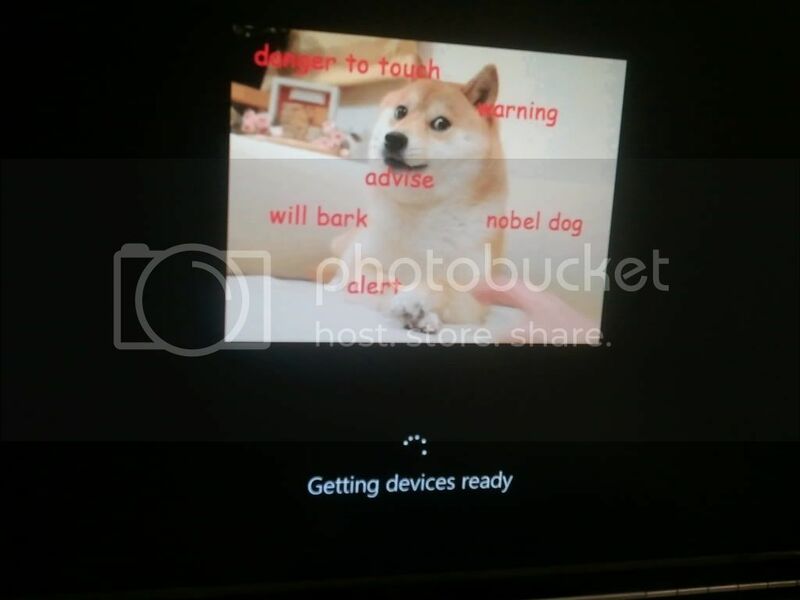 Alas, No success in getting Nuno to be the boot logo, it still shows the Doge. I can't change to Legacy boot because you can't boot GPT in Legacy on this hardware (or any? ), so this software does not help those who have existing UEFI/GPT installation and are not using an Intel manufactured board. It is "technically" possible to get other manufacturer's BGRT replacement software but you have to get it direct from them as they are not public. As far as the Surface goes, I highly doubt Microsoft would release the software that works on the Surface. Wow excellent research. Starscream thanks you Even if this means the Surface Pro 2 is dead in the water vis a vis the boot logo. I've managed to boot Windows under BIOS + GPT setup with a small virtual MBR disk image. I'd be very interested to see how this would work on more diverse machines, Tripredacus. Please read the above thread, post there for any clarifications at all. I added the "or any" comment in there because during my initial testing of Windows 7 on GPT disk, I was able to boot in either legacy or UEFI boot. I considered those cases to be a bug and did not record the particulars of which boards or BIOS versions I was using. I'm not sure how that thread relates to this one. In Windows 8, whatever it is exactly that creates the drawing animation will look for a specific second of the ACPI tables IF the OS is being booted in UEFI mode. If it is being booted in BIOS/Legacy mode, it does not look at this location. It doesn't matter whether the disk is GPT... or even if there is no HDD connected to the system. It has this behaviour when booting via DVD, HDD or LAN. As for how it determines which mode it is in, I can't say specifically. I have a program that I can run from Windows (or a PE) that will say what the mode is in a Message box, but I do not know how the author goes about determining that information. I didn't mean to taunt users but I have not the permission to redistribute this tool. It's very easy to determine which mode the OS booted from, everything from boot loader right down to the entry points are different, residing in different files. It's a very different environment, very easy to tell one from another. You know what would be cool...VHD booting or booting any other way, Windows 7 from a Surface Pro device. Let's hope Windows 9 cures the 8.x'ers Windows 7 envy. I think those early systems were not so "clear" as to what they were doing. For example, changing an option to enable UEFI boot and disable Legacy, but (maybe) Legacy wasn't really/fully disabled? There was also some manufacturers that were using emulation for GPT boot support on boards with a BIOS (not a UEFI). One example is MSI originally was not on schedule and instead released some feature called 2.2TB Infinity. To clarify my "both modes" comment. I was able to have an MBR disk boot in Legacy and UEFI modes, but of course a GPT disk was not detected as being bootable by the BIOS if UEFI was disabled. I figured there was a way to determine UEFI boot-mode, I never looked too far into it (or more exactly, didn't know where to look) so it was like some magic tool to detect the boot mode.